No one's really sure how long ago humans recognized the winter solstice and began heralding it as a turning point -- the day that marks the return of the sun. One delightful little book written in 1948, 4,000 Years of Christmas, puts its theory right up in the title. The Mesopotamians were first, it claims, with a 12-day festival of renewal, designed to help the god Marduk tame the monsters of chaos for one more year. Many, many cultures the world over perform solstice ceremonies. At their root: an ancient fear that the failing light would never return unless humans intervened with anxious vigil or antic celebration. There's much new scholarship about Neolithic peoples and their amazing culture. For example, it now looks as though writing is much more ancient than we earlier thought -- as much as 10,000 years old. Neolithic peoples were the first farmers. Their lives were intimately tied to the seasons and the cycle of harvest. I'm certain they were attuned to the turning skies. Scholars haven't yet found proof that these peoples had the skill to pinpoint a celestial event like solstice. Earliest markers of time that we've found from these ancient peoples are notches carved into bone that appear to count the cycles of the moon. But perhaps they watched the movement of the sun as well as the moon, and perhaps they celebrated it -- with fertility rites, with fire festivals, with offerings and prayers to their gods and goddesses. The rebirth of the sun. The birth of the Son. Christmas was transplanted onto winter solstice some 1,600 years ago, centuries before the English language emerged from its Germanic roots. Is that why we came to express these two ideas in words that sound so similar? 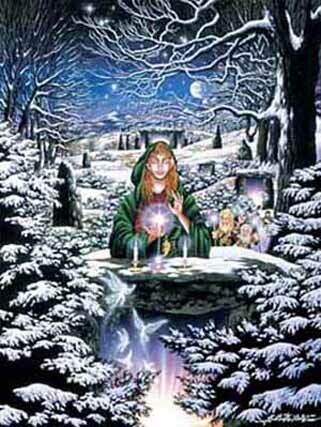 Winter solstice for 2007 will occur in North America on December 21 or 22, depending on your time zone. Chart for US time zones. "The rebirth of the sun. The birth of the Son."